The beginning of the band goes back to the beginning of the year 1988 when at that time the groups ATOXXXICO, PACTUM, ANARCHUS XENOFOBIA and GPK shared the place of rehearsal, El Thrasher (Bassist of Atoxxxico) together Adolfo and Pancho (Drummer and vocalist of Anarchus respectively ) begin to palomear (jamming) between rehearsal and essay, so, what began as a time of distraction was becoming an alternate project. At the end of 88 the group records a demo and in 1990 a split 7 "with PUTRID SCUM for the PPR label and from that year the Thrasher becomes part of the ANARCHUS lineup that in the following years will be the same Cacophony lineup : Thrasher (a.k.a Master Manipulator) - Guitar Miguel Güarrior - Low Francisco Porpuercosecayoen Michilini - Pleasant Voice Adolfo (into the money) - Battery Although to tell the truth about concerts there were occasions when El Barrabas (Voc / Bajo de PUTRID SCUM) offered himself as vocalist due to Pancho's lack of interest in performing live, the same thing would happen in the presentations at the end of the 90's where would fill the post the Hardcorin (Vocalist at that time of REGENERATION). 1991 marks the date to give good concerts and edit the second split ep 7 "on this occasion with BLOODSOAKED for the label MM Records, although from there in the next few years the group gave very few concerts with the same line of ANARCHUS the interest for the group It did not decay and that is how the German label Anomie Records decided to edit all its material that also included an essay and live tracks in an ep 10 "limited edition called" The Last Castration and More "which would be reissued in 2000 in the version of cassette but with the title "Greatest Hits" for the label Criptas Records. 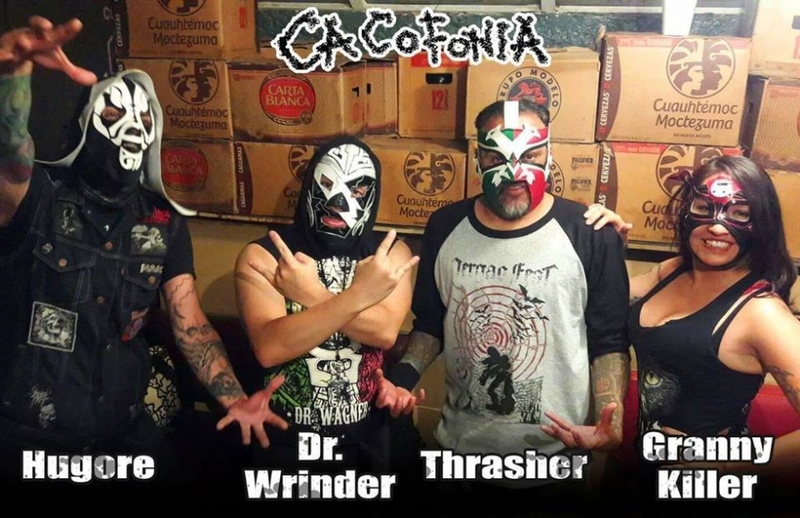 Thrasher leaves Anarchus in 2003 CACOFONIA turns 15 years old for which CACOFONIA returns with new lineup and the reissue of the "Greatest Hits" in cd version under the label Half Life Records of Los Angeles Ca. USA, and prepares the recording of his CD Oh no! Please not again! With the following alignment: Thrasher: Guitar and Voice Savage Grandpa: Battery Hugo Carne: Low Grouper Meat: Voice In 2004 the band is invited to a tour of Japan, so they decide to invite Pancho to do the tour with Anarchus respectively. At the moment the band is preparing its new material "The Revenge of the Mataviejitas" and a Recollection of 30 anniversary next to leave in 2018.